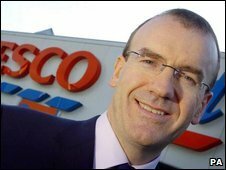 The chief executive of Tesco, Sir Terry Leahy has attacked the government’s woeful standards of attainment in education despite massive investment by Labour. “Standards have never been higher in our secondary schools. The vast majority of people working in education are on the front line, teaching in our schools,” a spokesman for the Department for Children, Schools and Families said.